Display your Christmas Cards along a string of lights with these cute clips. Glue a 1" pom poms about 1/2" from the bottom of one of the clothes pins. Glue another 1" pom pom above that. Cut a strip of felt (scarf) that is 1/4" wide and 3 1/2" long out of red or green felt. Glue the scarf, centered, just above the second 1" pom pom. Put some glue along the inside of each side of the scarf. One side at a time, wrap the scarf around his neck. Cut out a 3/4" diameter circle from the black felt. Glue it to the snowman's head. Cut out another piece of black felt that is 3/4" wide and 1 1/2" long. Roll the piece of felt from one short end to the other and glue in place. Add a centered ring of glue onto the black circle that you attached to the snowman's head. Place one end of the black felt roll into the glue for the top hat. Glue buttons on the two 1" pom poms. 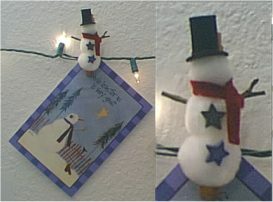 Glue short sticks behind the middle pom pom of the snowman's body. These clips are a fun way to display all the Christmas Cards you receive. Kids can make them* too! Add a magnet to the back of the wooden clothes pin to make them a magnet clip for the refrigerator.